One of the more unique brewers on the market. The Aeropress uses a microfilter with their press to allow for a rich extraction without the sediment found in traditional plunger methods. It uses air pressure to infuse the grounds. The initial pressed brew is a concentrate, to be diluted with hot water to personal taste and extraction preferences. The Aeropress is one of the more innovative brewing designs in quite some time. It's great for single cup brewing in the home or office, and also compact and durable for travel and camping. 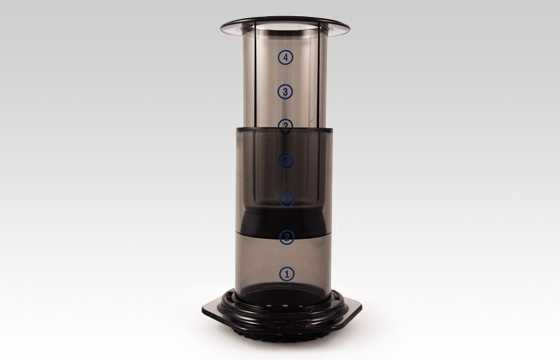 The Aeropress comes with a travel bag, pack of 350 filters, filter holder, stirring paddle measuring scoop and funnel. The plastic is BPA free, and made in the USA.